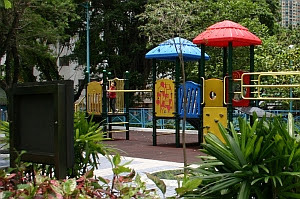 Tutubi, in his Hong Kong journey, also visited other places in the former British colony that once hosted people who played pivotal roles in Philippine history. "In May 1898, In this vicinity, the first Philippine national flag was sewn by hand by Dona Marcela Agoncillo, wife of Felipe Agoncillo, the first Filipino diplomat, assisted by her daughter Lorenza and Mrs. Delfina Herbosa Natividad, niece of the Philippine National hero Dr. Jose Rizal. This flag, which became the rallying symbol of unity for the Filipino people during the Philippine revolution, was officially unfurled during the proclamation of Philippine independence on June 12, 1898 in Kawit Cavite. 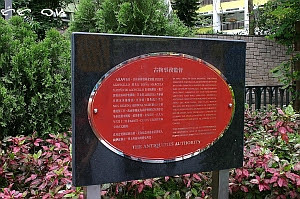 This marker is installed to commemorate the historical role of Hong Kong in the Filipino people's struggle for independence. After the brief visit and photo-op of the place, decided to board a bus plus a short walk and came face-to-face with the past and the present Victoria Prison, where overstaying foreigners in Hong Kong, including Filipinos are languishing. 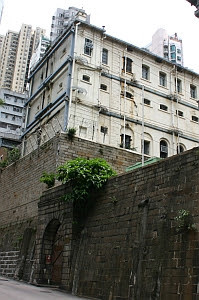 Nearby are the classical Central Magistracy building and Central Police station (Hollywood road); the three are already declared monuments and heritage sites of Hong Kong. Also on Arbuthnot road once stood the residence of Jose Maria Basa, an exile of 1872 (after the three priests Father Gomez, Father Burgos and Father Zamora were summarily tried and sentenced to death by the garrote for the Cavite arsenal revolt of January 20, 1872, an event that was inculcated in the young Rizal's mind. Rizal later dedicated his second novel El Filibusterismo to the three martyred priests). Jose Maria Basa hosted Rizal during Rizal's first visit to Hong Kong in 1888, and was responsible for sending copies of the banned Noli Me Tangere to the Philippines. He later acted as disbursement officer for the nationalist movement for procuring arms to be smuggled to the Philippines. 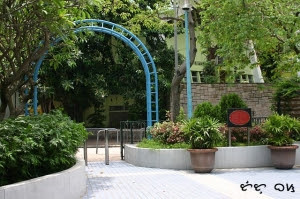 Further up Arbuthnot road, is the Hong Kong Botanical Garden, where the photo below, one of the most famous snapshotss of Philippine history, was reportedly taken with members of the Comite Central Filipino (aka Hong Kong Junta), led by Gen. Emilio Aguinaldo. Another significant contribution of Hong Kong to Philippine history was the Hong Kong -born British (and said to be Chinese) woman named Josephine Bracken, who accompanied his stepfather in Dapitan, where Jose Rizal was exiled. As you should know, Josephine Bracken was smitten by the sweet speaking doctor in Jose Rizal, and became the hero's last girlfriend. One of the quests made by scholars, including Ambeth Ocampo and Isabel Escoda, and history buffs is to find the exact location of poor Josephine Bracken's tomb. Sadly, tomb raiders and researchers, still, weren't able to locate it. Wow! That was some historical tour. I learned a lot from this post. It must have been a great feeling sensing one's history while going around a foreign land. What a great post. I love reading about my Filipino history. Great pics!! Interesting series of posts on Phil history. Never quite knew that Hongkong had quite a relevance to our history. interesting place in hongkong where you can learn some of the history of country. hope makapasyal din ako sa hk. Grabe this post is really timely for the books I'm reading now which I got from the Book Fair recently. You always surprise me with your knowledge. bw, hong kong was a haven of philippine heroes during the struggle for independence. Dr. Sun Yat-Sen also lent a hand to them at that time. history teachers should instill pride of place! hanep ang posing ng comite! hehe. maybe it's because the camera is still a new thing back then, but the guys in the pic aren't smiling like pinoys are now famous for.